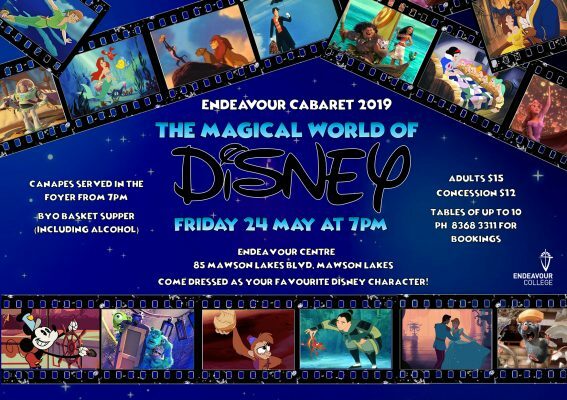 We are excited to announce the annual Endeavour College Cabaret will take place on Friday 24 May from 7.00pm – 10.00pm. The Cabaret is a showcase presented by the Music Department in a relaxed, round-table setting, conducive to enjoying the music while socialising over food and drinks. This year the theme is ‘The Magical World of Disney’, so naturally a wide array of Disney tunes will be performed by both Year 9-12 Music students and senior extra-curricular ensembles. Quizzes and other fun items will also feature throughout the night. Students and guests are invited to dress up as a Disney character! There will be prizes for the best-dressed audience members and students. Please book your tickets (or an entire table of up to 10) in order to come and watch the performance. Tickets are $15 for adults and $12 for concession (performers do not have to pay and will have their own allocated seating). Canapes will be served at the start of the night by Year 12 Food and Hospitality students and are included in the ticket price. All other food and drinks (including alcohol) are BYO (no bar facilities this year). Seats/tables cannot be booked without full payment. Please fill in this BOOKING FORM form with your payment details and email it to admin@endeavour.sa.edu.au or bring the form and your money to Main Reception. Anyone in the Endeavour community is welcome to attend, and if your child is involved, we highly encourage you to arrange a table.